Comic book-based movies continue to branch out into more genres away from superhero films, and this weekend brings an adaptation of one of the titans of the genre. Frank Miller’s Sin City is a classic in graphic novel circles, a pulp noir masterpiece that has been endlessly imitated for its gritty characters and dazzling artwork (despite being almost entirely black and white). 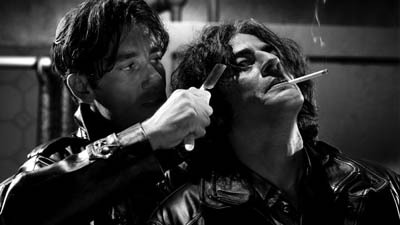 Miller had been reluctant to let any of his comics be adapted in the past; however, Robert Rodriguez, no stranger to films with a little of the old ultra-violence, was able to convince him that he was the man to direct this film and has faithfully, to the point of obsession, brought the comic to life on the big screen. Adapting several of Miller’s books into an anthology, Sin City brings together a star-studded cast headed by Bruce Willis, but also including Clive Owen, Benicio del Toro, Mickey Rourke, Jessica Alba, and Rosario Dawson, among many others. It’s a virtual cornucopia of character actors and pretty dames, who face off in the seedy underbelly of the depraved back alleys of Miller’s creation. Rodriguez actually co-directs with Miller, and gave up his position in the Directors Guild (along with his seat in several upcoming projects) to allow him to be credited as co-director. Obviously we can see how much the project means to him. His good buddy Quentin Tarantino also directed a segment, and I’m sure he felt at home in the material. Tarantino is a key reference point here, as he has seeded the mainstream for ultra-violence with films like the two Kill Bills and Pulp Fiction. The two halves of the Kill Bill series opened to $22 and $25 million respectively, and Rodriguez’s own Once Upon a Time in Mexico was a success in itself covering similar ground, opening to $23 million. So clearly there’s an audience for this kind of film, but it seems to be inherently self-limiting, as the intensity necessary to make the film be what is turns off as many people as it attracts. The trailer for Sin City and its associated ads are among the coolest in recent memory, enough that the film being largely black & white and weirdly styled are going to turn into positives. This could be the breakthrough film for this genre, or it could be just a cult hit, revered by many but reviled by most. I think it falls somewhere in the middle, opening to $25 million. Beauty Shop, the spin-off of the Barbershop films, opened on Wednesday. Starring Queen Latifah, it follows her character from the Barbershop sequel as she moves from Chicago to Atlanta and starts her own salon. Well, that’s after leaving the shop she started in, run by Kevin Bacon (! ), and bringing along her sassy friends, including Alicia Silverstone and Djimon Hounsou. Largely plotless like the Barbershop films, Beauty Shop is relying on character and dialogue to carry the film. Its first day brought in just slightly over $2 million, a decent sum, but not at the level of a hit. Barbershop was a surprise hit in 2002 opening to $20 million on just 1605 screens, and its sequel brought in $24 million last February in its opening weekend. Ice Cube was the driving force behind them and it’s hard to imagine Queen Latifah matching his draw. That $2 million Wednesday should translate into about $14 million for the weekend. The Upside of Anger expands to 1,111 screens this weekend after three weeks in limited release. Its limited run has been moderately successful, earning $4 million on a maximum of 167 screens. The Joan Allen/Kevin Costner film from director Mike Binder (of The Mind of the Married Man) is a look at three years of Joan Allen’s character life after a painful divorce, and her slowly developing romance with Kevin Costner, a former Detroit Tigers pitcher. After the tentative limited release, The Upside of Anger is getting a good promotional push for this wide release. However, it’s still not likely to break through at this still-limited release. Look for about $4 million for this film this weekend. Last week’s number one, Guess Who, had a decently strong first weekend with just over $20 million. The Ashton Kutcher/Bernie Mac comedy of manners struck a chord as a “Meet the Parents-lite” kind of film, although the inter-weekend takes don’t point to extremely strong legs, as it earned quite a bit less than three times its Friday. It shouldn’t do too terribly, but don’t look for it to hang around very long either. Give it $12 million for its second weekend. Sandra Bullock has said she’s saying goodbye to the romantic comedy genre, but if Miss Congeniality 2’s grosses are any indication of anything, she might be forced to come back to that sometime in the future. Opening to a modest $14 million, the odds of it matching the $107 million of the first film are pretty slim, due do it being a sequel and with its release outside of the Christmas season. Honestly, $50 million could be a stretch. Its second weekend might be as low as just $8 million, close to a 50% drop. Robots isn’t busting any blocks, but at least its weekend drops are held to the 40% mark. It should pass the $100 million plateau this weekend, earning around $8 million and keeping a spot in the top five. The Ring Two went into freefall in its second weekend, dropping over 60% to $13.6 million after an opening of $35 million. Hollywood seems to be at a complete loss as to how to handle a horror sequel these days. At this rate, it should top out around $75 million total, just barely twice its opening weekend. Give it a meagre $6 million this weekend, or a full 80% drop in just two weeks.